Darcy’s student, Rebecca Wolfe, earned her USDF Bronze Medal. Above, Becky riding Celtic Maiden. 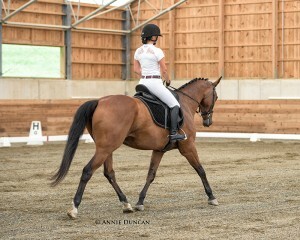 Darcy’s student, Stephanie Sinson, showing Winnagan. Blue Goose Stable in Cochranville, Chester County, PA is a small but active facility where adult amateurs and children interested in dressage and low level eventing can find a home. There’s no need to leave the farm to compete — Blue Goose offers monthly dressage and combined test schooling shows. They also offer three US Dressage Federation/US Equestrian Federation recognized shows. Trainer/Instructor Darcy Miller, who lives on the farm, has earned her USDF Bronze and Silver Medals as well as her Silver Freestyle Bar. 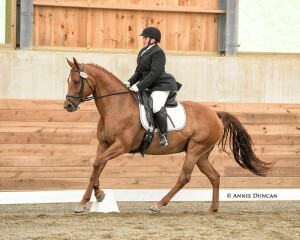 She is also a USDF L Program Graduate available for judging schooling shows. As a junior rider Darcy trained in hunter seat equitation with Mary Warner of Derby Down Stables. She then moved into dressage and eventing, training with Rebecca Langwost Barlow, Gabriel Aramando, Jim Koffard, Jim Woffard and other national clinicians. Darcy also has a background in natural horsemanship. With a focus on safety above all and mastering the basics first, she believes in cross training her horses and her students. She teaches lunge lessons and cavaletti sessions and hacks out both her lesson horses as well as her competition horses. She also works well with timid riders. Blue Goose also offers lessons on the farm’s horses and boarding. The 24 acre farm has 23 matted stalls, a large heated tack room attached to the 40’x 90’ indoor arena, three outdoor arenas, a 90’x 225’ dressage arena with sand and rubber footing, a 90’x180’ sand schooling arena, a 135’x235’ stadium jumping arena with sand footing and a 50 foot round pen. Horses are turned out in small groups in six fields. To learn more, phone Darcy at (610) 999-5231 to schedule a tour.